The “snow line” (also called frost line, ice line, snow boundary, etc.) is the distance from a central protostar at which ice grains can form– this occurs at temperatures of about 150-170 K. At the snow line, the density of solid particles in the disk increases rather abruptly. This increase in solid-particle surface density changes the time- and mass-scales of planets that form beyond this distance. Specifically, the isolation mass of planetesimals is amplified by a factor of ~8, and these cores also form faster. 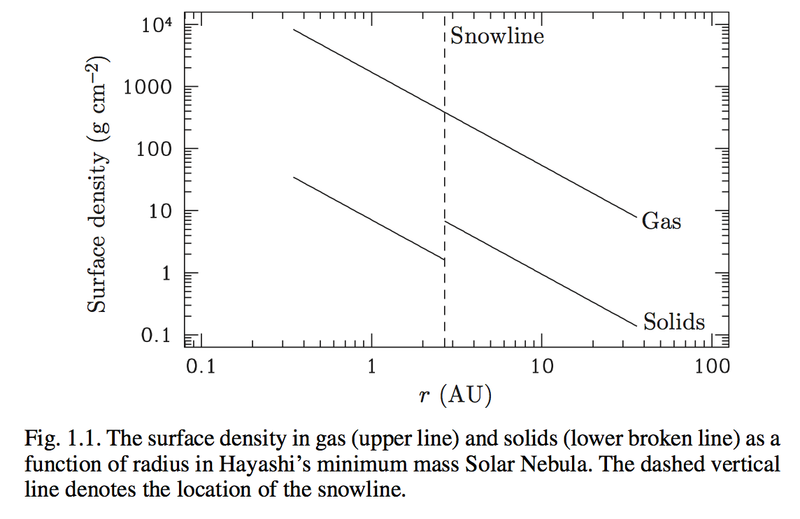 These factors, taken together, mean that gas giants form much more easily beyond the snow line, since cores that form beyond the snow line are more massive and have a longer time to accrete gas from the disk before it dissipates. Observations of asteroids and inspection of meteorites suggest that the snow line in our Universe is located at about 2.7 AU from the Sun (beyond this radius, the asteroids are much more water-rich). How to arrive at this precise distance is currently an open question; when plugging in naive values for our Solar System, theorists have found a Solar system snow line at 1.7 AU, almost a factor of 2 too short. Also note that Earth is well within this radius; it is a matter of current research as to how Earth got it’s large amount of water, given that the water at 1 AU would have all been in vapor form. Please scroll down for more information on each of the topics discussed above. We will explore the effects of the snow-line, the temperature at which the snow-line occurs, how to compute the snowline, and finally look at some of the current research questions involving snow-lines and planet formation. As shown in the above figure, the direct consequence of the snow line is an amplification of the solid surface density by a factor of ~3-4. This has two effects. First of all, it increases the isolation mass , which is the mass a body can grow solely through planetesimal accretion. is proportional to (where is the surface density and is the orbital radius). [Please see this link for a quick derivation of why this is so]. Hence a density amplification of ~3-4 translates to an amplified isolation mass by a factor of ~5-8. Furthermore, due to the term, planetary cores which form beyond the snow-line are much larger than those that form within it; (In our Solar System, at 1 AU, whereas at 5 AU, near Jupiter’s orbital radius). Furthermore, since the timescale for planet formation is roughly proportional to 1/ , the snow-line helps gas giant cores to form faster. These two factors (higher core mass and faster core formation) are crucial in the formation of gas giants, since they must accrete gas quickly before it dissipates in the disk. The gas in the protoplanetary disk dissipates on the timescale of a few million years due to accretion onto the central protostar and evaporation from the protostar’s irradiation. The larger cores that form beyond the snow-boundary have a longer time to accrete gas, forming large gas giants that could not form within the snow line. 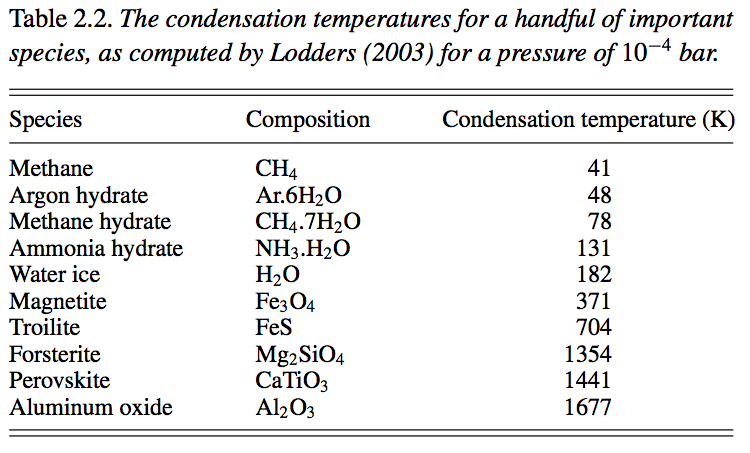 In the above table, some common ices are listed, along with the temperature at which they condense to form ice grains. Notice that for water ice to form, the temperature must be below about 180 K. The table lists condensation temperatures at a pressure of bar, which is thought to be slightly higher than the true midplane density of protoplanetary disk in the range of a few AU from a central protostar– the true temperature range of the snow line is thought to be about 150-170 K.
Next we assume that the disk is optically thick, which allows us to simplify the radiative transfer calculations and calculate the mid-plane temperature due to accretion: , where is the Rosseland optical depth of the disk. We now account for the effect of the irradiation from the central star. Consider the disk far away from the star, so . From simple geometric considerations, the flux from the central star on the disk is given by , where is the grazing angle at which starlight hits the disk. In the steady state, this energy is also re-emitted, giving an effective irradiation temperature: . Note that is is usually taken to be about . Increase the surface density: However, though the optical depth grows linearly with the surface density, only grows as . Furthermore, the sublimation temperature increases with pressure (which increases with density), which acts to push the snow-line further in towards the star. Increase the optical depth directly: This would correspond to having smaller grains in the disk, however this is difficult to justify in light of observations of young protoplanetary systems. Another open question is how to explain the presence of Earth’s large water content (both its oceans and the water locked in its mantle), since the Earth formed within the snow line where ice grains could not form. Answering this question will give us greater insight into the so-called habitable zone and how planets form here with the potential for life similar to our own.